The amount of time it takes to build your home depends on the type of home you’re building and various other factors, like labor supply and weather. According to the 2015 Survey of Construction from the Census Bureau, the average completion time of a single-family home is around seven months. It’s important to note that factors, such as the complexity of the project — the land on which the home is being built, the area where the home is being built and the intricacy of the home’s floor plan — will affect the building timeline. Custom homes can take longer to complete than production homes, while manufactured homes typically can be completed in a few months. After speaking with the experts, we’ve identified the five most commonly cited factors influencing construction time: pre-construction and permits, environment, workers and supplies, changes and construction style. Although knowing what to expect may not speed up the process, it might just help you maintain your sanity. Pre-Construction and Permits Before a builder can start building your home, the home’s lot must be prepared. That means clearing trees, rocks and other items, rough grading and leveling for the foundation. Depending on how much work is involved — say there’s an unexpected issue while clearing the lot — there can be delays during pre-construction. Getting proper approvals and permits can also cause delays. “Factors like approval on building permit and inspections process can vary between locations and can lengthen the time to a completed home,” says Matthew Gaudet-Walters, a sales representative for Walters Homes. Environment Depending on where the home will be, building times can be affected by region of the country — homes in the Middle Atlantic Region averages about 9.5 months from start to completion, while the Mountain Region construction averages around six months. Construction in metropolitan areas is usually quicker — seven months, compared to nine months in more rural areas. “Although construction workers can do a lot of work in the rain, such as trenching or cutting down trees, there are some things that can be held up because of the rain,” says Kyle Alfriend, a Realtor with the Alfriend Group in Dublin, Ohio. “Primary weather factors — including the winter freeze — prohibits the pouring of concrete for the foundation and spring rains saturate the ground so much that holes cannot be dug for basements without walls caving in.” Availability of Workers and Supplies The summer months are generally the busiest time for home construction, so you might find your new home’s construction delayed while waiting for the necessary labor to be available. “One element in our construction time calculations is the available labor pool and how which specialists are needed among the subcontractors, like the electricians, plumbers and framers that the design calls for,” says Peter Di Natale, president of Peter Di Natale & Associates, a New York-based homebuilder and contractor. Changing the Plan Change orders will usually extend the build time, especially if they occur in the latter part of the process. Di Natale also notes that when buyers wait until the last minute to choose their finishes, this can cause delays. “For example, cabinets usually take six to eight weeks to order and one to two weeks to install, so selecting cabinets when it is time to install them will cost you two months or more.” To limit the amount of time lost to decision delays, you should maintain open communication with your builder. After all, throughout the construction process, there will be many decisions that you must make along the way. Construction Style The style of your home will also influence construction time. Custom-built homes average 10 to 16 months, while personalized production plans average four to six months. 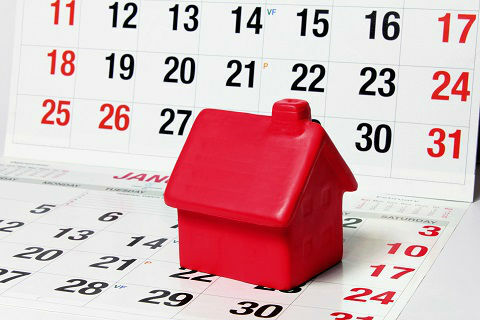 Because the floor plans used by production builders have been built many times before, there are generally fewer delays. “Choosing a standard floor plan will quicken the building process, because it eliminates any variations that the builder will need to work out,” says Gaudet-Walters. So what can you do to make sure the construction of your new home is as painless as possible? Collaboration is the key: “Engaging construction managers and going through adequate pre-planning and estimating as early as possible will save time and money in the long run,” says Di Natale. Delays in construction may be a fact of life, but knowing what to expect and how to manage your expectations can help make the building process less stressful. Seve Kale is a writer for NewHomeSource. You can find her on Google+.